This outdoor heating unit will compliment any yard as it is the most naturally designed fire bowl. With a 50,000 BTU heat output and low profile, you will receive the ideal amount of warmth at the best height for conversation. This unit is sure to be the main attraction during gatherings. 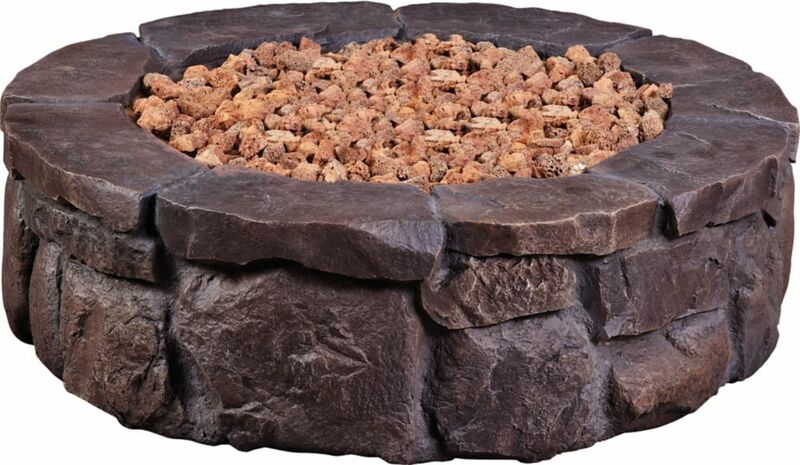 This unique Brentwood Fire Pit will spruce up your outdoor space. It features a warm copper paint that makes it stand out. The included wood grate lifts the firewood to provide air flow for a better and more consistent fire. Drainage holes help to allow water to drain out the bottom. A mesh cover and ash catcher help to prevent sparks and ashes from escaping. Use the included cooking grid for BBQ's. Invite your family and friends to roast marshmallows around the Brentwood Fire Pit. Caswell Gas Fire Pit This outdoor heating unit will compliment any yard as it is the most naturally designed fire bowl. With a 50,000 BTU heat output and low profile, you will receive the ideal amount of warmth at the best height for conversation. This unit is sure to be the main attraction during gatherings.